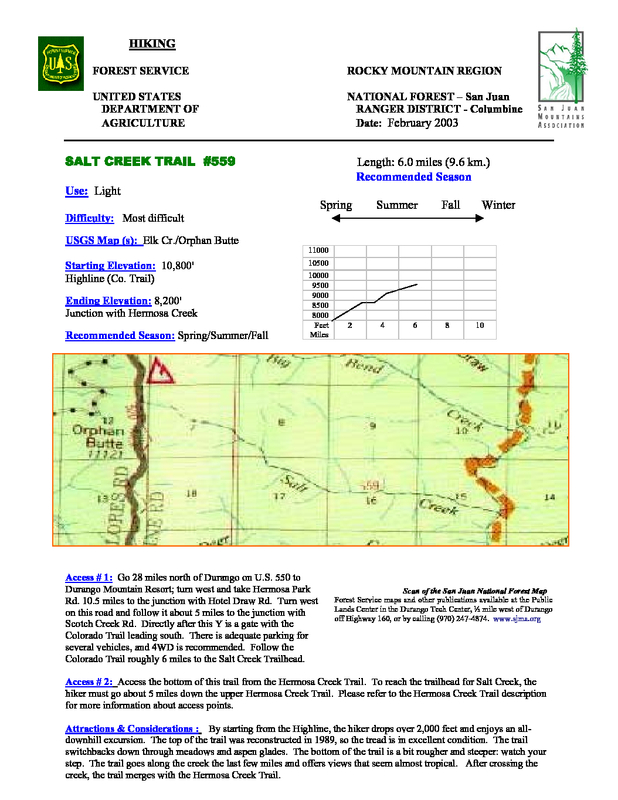 Salt Creek Trail #559 is a 5.6 mile one way hike with 88 feet accumulated elevation gain. Located 22 miles north-northwest of Durango Colorado. By starting from the Highline, the hiker drops over 2,000 feet and enjoys an all-downhill excursion. The top of the trail was reconstructed in 1989, so the tread is in excellent condition. The trail switchbacks down through meadows and aspen glades. The bottom of the trail is a bit rougher and steeper: watch your step. The trail goes along the creek the last few miles and offers views that seem almost tropical. After crossing the creek, the trail merges with the Hermosa Creek Trail. To reach Salt Creek Trail travel 28 miles north of Durango along US 550 to Durango Mountain Resort, turn west and travel along Hermosa Park Road 10.5 miles to the junction with Hotel Draw Road. Turn west onto Hotel Draw Road and continue about 5 miles to the junction with Scotch Creek Road. Directly after this Y is a gate with the Colorado Trail leading south. Follow the Colorado Trail about 6 miles to the Salt Creek Trailhead.